A choral society showed a film about a nonviolent “singing revolution” in Estonia to promote ideals of social change and freedom at an Evanston Public Library event Saturday. The North Shore Choral Society, which is partially funded by the city and primarily based in Evanston, screened “The Singing Revolution,” a documentary recounting the ways Estonians used singing in the late 1980s and early 1990s to proclaim their desire for independence after over 50 years of Soviet occupation. 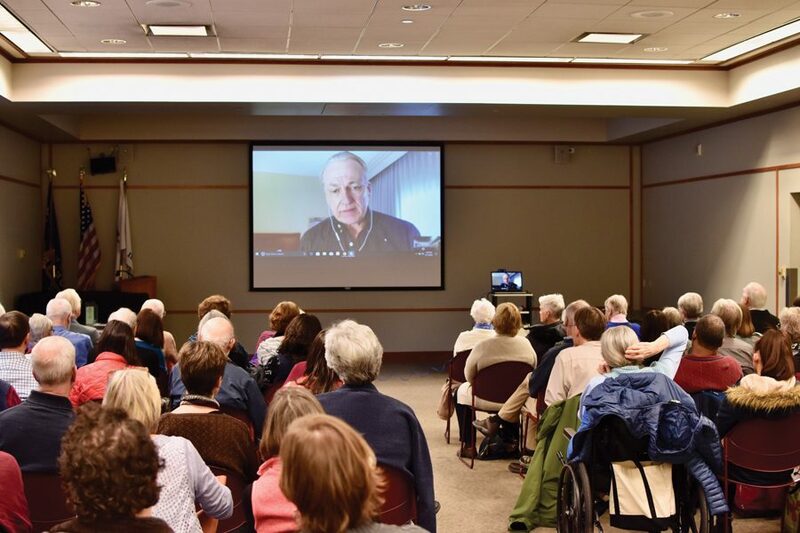 The screening — which about 70 people attended — included a Skype introduction and Q&A session with one of the movie’s filmmakers, James Tusty. At the event, Tusty said he thought the power of the film was not in the filmmaking but in the real history it was based off of. He added that he found it “amazing” that multiple generations of Soviet education did not change the Estonians’ desire for independence. “It’s another thing, in my view, to have two entire generations of children go through an educational system where you teach them what you want them to know about history or how you want them to perceive it — and 30, 40, 50 years later, the children are still saying, this is a bad occupation; I want a free Estonia,” Tusty said. North Shore Choral Society music director Julia Davids told The Daily the group screened the film because it will be performing three pieces that connected to the singing revolution at an upcoming concert on social change. The singing revolution was a nonviolent way to achieve independence for Estonia, she added. Davids said the concert will also include music that reflects other causes, like the civil rights movement, the independence of women and the amplification of minority voices. “As artists we are always striving to find ways to make our art meaningful, to have our art connect to people, connect to our communities and to elevate and amplify causes,” Davids said at the event. Davids added that she was put in touch with the filmmakers by someone she knew who had done a lot of research on the singing revolution. Estonian Honorary Vice Consul Siim Sööt (Weinberg ’67) said during the event that the film showed the importance of song and how it moves people. Sööt told The Daily the film matters because there are many people in the world we don’t understand well, who want their traditions and their heritage maintained. He added that the film’s message was two-fold.